Peak Oil is about the "Peak" in oil production... we sir have peaked, we did so in 2006. We are in what's called an undulating plateau and will soon enter a irreversible decline in oil production. We will NEVER run out of oil, we simply will run out of CHEAP oil... easy to find and produce oil... I hope this sinks in clearly. Please go to www.theoildrum.com and do a bit of reading. 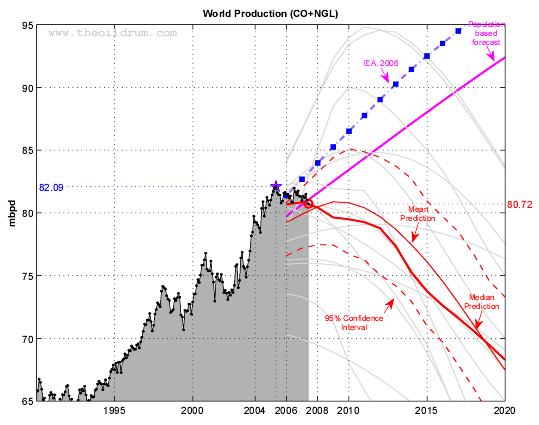 Wiki oil megaprojects data indicates just under 6 mbd new capacity for 2008, based on a delayed project peak oil basis. An eight year average is a better statistic and indicates that about 4 mbd of new production will come online this year, shown in the chart below. Below is an updated chart from wiki oil megaprojects. The most recent megaproject update is the delay of Khurais crude, condensate and NGL startup from Dec 2009 to Jan 2010. There is just enough new production coming online to offset existing total liquids decline for this year and hopefully most of 2009. However, world crude and condensate project capacity additions are unlikely to be sufficient to offset existing C&C field natural decline rates, resulting in irreversible net C&C decline. World total liquids production (Fig 1) remains on a peak plateau since 2006 and is forecast to fall off this peak plateau in 2009. Increasing numbers of oil experts are forecasting impending peak production plateaus. According to the International Energy Agency (IEA), the current peak production of 87.2 mbd occurred on January 2008. As long as demand continues increasing then prices will continue increasing. 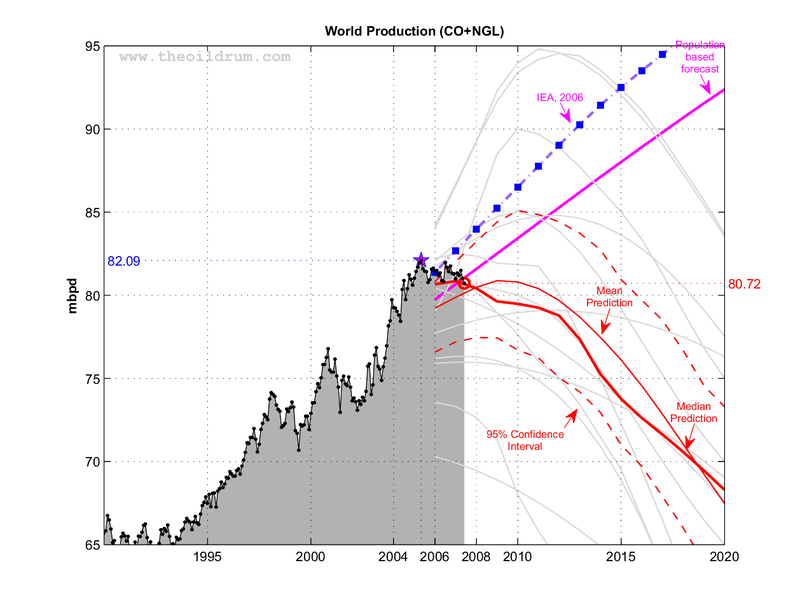 Forecast world crude oil and lease condensate (C&C) production retains its 2005 peak (Fig 2). The forecast to 2100 shows declining C&C production, using a bottom up forecast to 2012 (Fig 3). The forecast to 2012 shows a slight decline to 2009, followed by a 3%/yr decline rate to 2012. World C&C year on year production changes to October 2007 and November 2007 (Figs 7 and 8) show significant declines for Mexico, North Sea and Saudi Arabia and significant increases for Russia, Azerbaijan and Angola. As Russia is likely to be on a production plateau and Saudi Arabia, Kuwait and the UAE have probably passed peak production, the world C&C production will continue to decline slowly. Saudi Arabia retains its 2005 C&C peak (Fig 10), which is the same as the peak year for world C&C (Fig 2). Saudi Arabia C&C production has dropped to 9.0 mbd which is 0.6 mbd less than its peak in 2005. It is now almost a certainty that Saudi Arabia passed peak C&C production of 9.6 mbd in 2005 (Figs 9 and 10). Kuwait retains its 2006 minor C&C peak (Fig 12). Kuwait C&C production has now dropped to 2.5 mbd which is less than its peak in 2006. There is a strong likelihood that Kuwait has passed its minor 2006 peak (Figs 11 and 12). Kuwait’s major peak was 3.3 mbd in 1972. UAE retains its 2006 C&C peak (Fig 14). UAE C&C production has now dropped to 2.6 mbd, adjusted for maintenance, which is just less than its peak in 2006. There is a reasonable likelihood that UAE passed its 2006 peak (Figs 13 and 14). World oil production (EIA Monthly) for crude oil + NGL. The median forecast is calculated from 13 models that are predicting a peak before 2020 (Bakhiarti, Smith, Staniford, Loglets, Shock model, GBM, ASPO-[70,58,45], Robelius Low/High, HSM). 95% of the predictions sees a production peak between 2008 and 2010 at 77.5 - 85.0 mbpd (The 95% confidence interval is computed using a bootstrap technique). Click to Enlarge. Where will the projected extra 25 mb/d oil production come from? I added up all of the peak flows from projects on the soon to be completed http://en.wikipedia.org/wiki/Oil_Megaprojects . Excluding the unapproved Kashagan project and including a small percentage of 2007 projects, the total new optimistic peak capacity project additions from 2007 to 2012 is just over 27 mbd. This number is close to Birol's 25 mbd. The IEA has admitted above that non OPEC production is about to peak. Birol says that there are only 25 mbd of approved project capacity. As this is just barely enough to replace lost capacity from his estimate from above of 23.9 mbd for existing field decline, Birol is effectively admitting that world oil production is on a peak plateau now. If a slightly higher underlying decline rate of 4.5%/yr is used then world total liquids supply is in slow decline now, rather than a plateau. 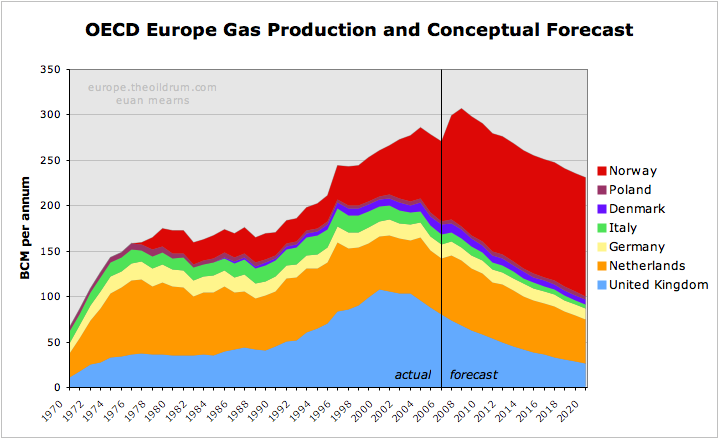 OECD European gas production looks set to peak in 2008. After that, falling production combined with rising demand will see OECD European gas imports wanting to rise from current 197 BCM per annum to 442 BCM per annum by 2020. Where will this gas come from and how will rising European imports affect N America and the rest of the world? ... or is Europe running low on natural gas? Will Nuclear Fusion Fill the Gap Left by Peak Oil?